Product innovation is on a rise in the healthcare industry. Research and development activities in the market are also leading to the development of new and technically advanced devices. Increasing adoption of a minimally invasive procedure is leading to the development of devices for soft tissue repair. Major companies are also focusing on entering into a partnership with other companies during the drug development and manufacturing process. Merger & acquisition activities are also taking place on a large scale, as companies are looking forward to strengthening their position in the global market for soft tissue repair. The companies are also focusing on developing methods that can speed up the process of soft tissue injury repair. New techniques are being developed for soft tissue repair, as techniques which involves the use of synthetic and grafts material has often proved to fail. This is mainly due to the loss of blood supply. Increasing funding from government and other organizations is also contributing to the growth of soft tissue repair market. For instance, Biomedical Advanced Research and Development Authority and the National Institutes of Health are the major contributors to the development of soft tissue repair in the U.S. The report by Persistence Market Research expects the global market for soft tissue repair to see a steady growth between 2017 and 2024. Towards 2024 end, the global soft tissue repair market is projected to reach US$ 7,391.9 Million in terms of revenue. 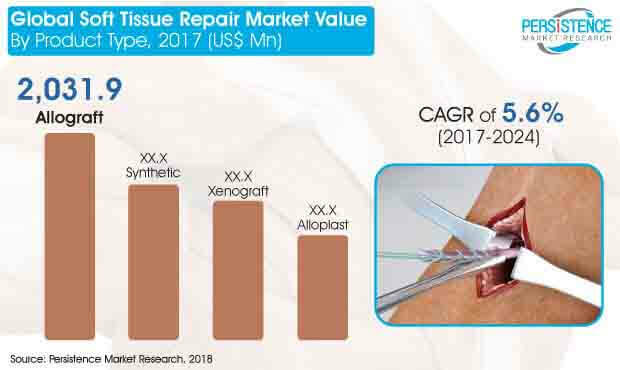 Compared to various products in the soft tissue repair such as xenograft, alloplast, and synthetic, allograft is expected to witness significant growth between 2017 and 2024. Minimizing operating time and causing less pain are some of the factors driving the growth of the allograft in the soft tissue repair. It is also one of the highly preferred procedure in complex cases. However, allograft sometimes can fail as it carries the risk of immune response complication. Which includes the failure of soft tissue to incorporate itself in the function of the body. Allograft is also being used on a large scale in spinal fusion as it eliminates the need for an additional surgical procedure and also eliminates donor site problem such as infection. Owing to the risk associated with allograft, the use of synthetic bone graft material is gaining popularity in the healthcare industry. Various formulations are available for synthetic products, however, companies are focusing on introducing new formulation for developing synthetic bone graft material. Growth in the number of accidents across the globe is resulting in the rise in a number of accidental injuries and also growth in the soft tissue injury. This is leading to the increasing number of people being admitted in the hospitals. Hence, the methods or techniques for soft tissue repair is being used on a large scale in hospitals. Moreover, the government of different countries are also investing in the development of healthcare infrastructure. This is also resulting in the growth of the global soft tissue repair market.